Gestational trophoblastic neoplasia comprises a unique group of human neoplastic diseases that derive from fetal trophoblastic tissues. They are proliferative as well as degenerative disorders of placental elements and include complete or partial hydatiform mole (90%), invasive mole (5-8%) which could also be metastatic, villous or a villous choriocarcinoma (1-2%), and placental site tumor (1-2%). During the study period of 5 years, from January 2009 to December 2013, there were 17 cases analyzed retrospectively. Gestational trophoblastic neoplasia (GTN) is classified histologically into three distinct subgroups: choriocarcinoma destruens (invasive mole), choriocarcinoma (CC) and the very rare placental site trophoblastic tumor (PSTT) [1,2]. About 50% of all cases of GTN occur postmolar gestations, 25% after abortions or ectopic pregnancies and 25% after term or preterm deliveries . PSTT and epithelioid trophoblastic tumor (ETT), however, develop after term deliveries or non-molar abortions in 95% of the cases . Invasive mole and choriocarcinoma, which make up the vast majority of these tumors, always produce substantial amounts of human chorionic gonadotropin (hCG) and are highly responsive to chemotherapy with an overall cure rate exceeding 90%, making it usually possible to achieve cure while preserving fertility .This success is due to the unique sensitivity of these two trophoblastic neoplasms to chemotherapy and the use of hCG as a tumor marker for diagnosis, monitoring treatment and follow-up. In contrast, the rarer PSTT and ETT have low hCG levels  and are relatively resistant to ChT. Therefore, the first-line treatment in these cases is surgery, particularly in no metastatic cases . Seventeen cases of GTN managed over a period of 5 years from 2009 to 2013 were analyzed retrospectively to find out the incidence of GTN in relation with variables like age, gravidity, presentation, and the outcome . During the study from January 2009 to December 2013, there were 21997 births. While 129 cases of GTD were diagnosed (1out of 170 of births) of which 17 cases were defined as GTN giving an incidence of 13.2 % of GTD. All the subjects were above 20 years old, 7 women (41.2%) were between 20 and 30 years old, 6 women (35.3%) were between 31 and 40 years of age and 4 (23.5%) were over 40 years. 1 case (5.9 %) was primigravida, 16 women were multigravidas and 4 patients (23.5%) had undergone abortion in the past. 53% of women had blood group A+, 35% had O+, 6% had B+, and 6% AB+. Overall 6 women (35.3%) had vaginal bleeding, while 11 (64.7%) were asymptomatic. Theca lutein cysts were revealed only in 4 (23.5%) cases. 15 women (88.23%) had hydatidiform mole [8 with complete mole (47%), 3 had partial mole (17.6%)], and 4 (23.5%) with unidentified mole whether partial or complete. 2 women (11.7%) had miscarriage without histological examinations. For 11 women (64.7%), which were asymptomatic, the diagnosis was carried out the disrupted biological evolution (β-hCG stagnation on 4 weekly dosages or increase of β-hCG levels for over 10% on 3 weekly dosages). All patients with a GTN in this study were examined through the staging using ultrasonography (Figure 1) with transvaginal Doppler, lung X-ray, CT thoracic abdomino- Pelvic . Brain CT was done in 2 patients due to headache (access to brain MRI was limited) and pelvic MRI was done in 3 patients. Figure 1. Invasion of myometrium. The diagnostic criteria used in all the patients are the FIGO criteria proposed in 2002. In our series there were 5 cases of lung metastasis on the lung X-ray that were confirmed by the TAP CT (Figure 2). But no hepatic, brain, or vaginal metastasis was found. The risk scores range between 3 and 10. A majority of our patients (59%) were low risk (score <6). 35% of patients were in high risk (score >6) and a women left out against medical advice before completing the radiological assessment for the scoring. All the 10 patients with low risk underwent the same protocol based on a mono chemotherapy methotrexate 1mg / kg AJ1, J3, J5, J7. The protocol was repeated every 14 days. For 6 patients with high risk scores, the protocol adapted was BEP: bleomycin, etoposide, and cyclophosphamide. The protocol was repeated every three weeks. The follow up of these patients was done in parallel at our department and at the Oncology department where they received the treatment. We advocate further three courses of chemotherapy after negative tests, and we consider the rate of β-hCG as negative from 25 mui/ml. A hemostatic purpose in one case. To reduce tumor mass and decrease the number of treatments required to achieve complete remission, especially women who fulfilled their parental project and are not about to monitoring in 4 cases. The clinic: systematic comprehensive review at each visit. 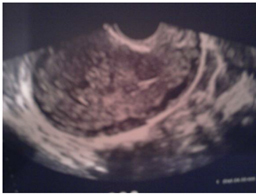 Pelvic ultrasound before each chemotherapy course if uterine tumor. Other explorations according to the call sign. Once a week during chemotherapy and subsequent 8 weeks. Then every month up to 12 months if GTN good prognosis, and up to 18 months if GTN poor prognosis. For the majority of our patients this rate was observed. 4 patients underwent a complete surveillance and were declared cured. 1 woman is being monitored after completing her cures. 4 women interrupted the treatment and disappeared, including 1 after completing her course. 1 case of death from acute leukemia was reported in chemotherapy phase. 2 patients were declared cured. 1 death was reported due to complications of chemotherapy treatment. Gestational trophoblastic neoplasia (GTN) are malignant lesions that arise from placental villous and extra-villous trophoblast [5,7]. GTN occurs in 1:40,000 pregnancies and is more common in Asia than in Europe or North America . Four clinicopathologic conditions make up this entity: 1) Invasive Mole (IM) that follows either a complete (CHM) or partial hydatidiform mole (PHM), 2) choriocarcinoma (CCA), 3) placental site trophoblastic tumor (PSTT) and 4) epithelioid trophoblastic tumor (ETT). Each of these conditions can perforate the uterine wall, metastasize and lead to death if left untreated. About 15% of all molar pregnancies will develop into gestational trophoblastic neoplasia (GTN) [5,8]. GTN arises when the normal regulatory mechanisms controlling the proliferation and invasiveness of trophoblastic tissue are lost. Originating in placental tissue, they are characterized by a distinct tumour marker (β-hCG) and have varying tendencies towards local invasion and distant metastasis . Approximately 50% of cases of GTN arise from molar pregnancy, 25% from miscarriage or tubal pregnancy, and 25% from term or preterm pregnancy. Ultrasound can be used to help find out if a mole is invading local tissues. Transvaginal ultrasound (TVUS) imaging is a, fundamental tool for the diagnosis of GTN, but different diseases may have similar appearances on imaging studies . The most common finding is a focal myome trial mass. The image may be hypo- or hyperechoic, or complex and even multicystic. Intramyometrial anechoic spaces result from hemorrhage and tissue necrosis or vascular spaces [12,13]. Color Doppler ultrasound may demonstrate intense chaotic vascularity and loss of vessel discreteness. It demonstrates high-velocity, low-resistance flow in contrast with the flow usually detected in normal myometrial arteries. However, PSTT may be hypo- or hypervascular . A chest X-ray is the imaging method recommended by FIGO to evaluate lung metastases . However, up to 41% of the patients with lung metastases on computed tomography (CT) have a normal chest X-ray. 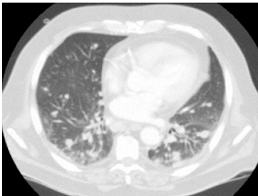 Pulmonary micrometastases are better evaluated using chest CT, but its use is questionable because the presence of micrometastases does not seem to affect long-term survival . Other imaging studies, such as magnetic resonance imaging (MRI) and CT, are not part of the routine assessment of GTN and are used only in equivocal cases or when metastatic disease is suspected [12,15] . In 2002, FIGO (Table1)  adopted a combined anatomic staging and modified WHO risk-factor scoring system for GTN. Treatment is based on the total score which signifies the risk of the patient developing single-agent drug resistance. Patients with non-metastatic disease (Stage I) and low-risk metastatic GTN (Stages II and III, score <7) can be treated initially with single-agent chemotherapy with either methotrexate or actinomycin D with cure rates approaching 80-90%. Low risk patients are usually treated with single agent chemotherapy. Single agent actinomycin-D or methotrexate with or without folinic acid is the primary therapy [17,18]. With appropriate initial classification and proper treatment, cure rate approaches 100%. Careful monitoring for evidence of drug resistance (plateau or ↑ β-hCG and/or devolvement of new metastasis) as 30-50% develop resistance to the first line chemotherapy agent and 5-15% may require multi-agent chemotherapy and/or other modalities. DuBeshter et al. treated 48 patient between 1965 -1990 with low risk metastatic GTN with single agent MTX or actinomycin D and noted all patients achieved sustained remission, although 51% required 2nd single-agent regimen and 14% need multi-agent chemotherapy, and 12% underwent resection of resistant tumor foci. 1 to 2 cycles of maintenance chemotherapy should be given after the first normal β-hCG. Single agent methotrexate typically achieves complete response rates ranging from 48 to 74% after four to five cycles and single agent actinomycin-D has better complete response rates (70 to 100%) [19,20]. Actinomycin D in methotrexate resistant patient could increase the cure rate > 95%. Despite resistance to first –line chemotherapy, cure rate of almost 100% is achieved with combination chemotherapy. In Gynecologic Oncology Group (GOG) 174, Patients with GTN and a WHO score of 6 or less are randomized to 30 mg/M sq methotrexate IM q week vs. 1.25 mg/M sq Actinomycin D IV push every 2 weeks. The biweekly actinomycin D had higher CR rate by 17% (p=.01), than the weekly IM methotrexate regimen, while both regimens were well tolerated [21,23]. In another retrospective study combination chemotherapy with actinomycin-D and methotrexate for a median three cycles achieved 98% response rate, with limited grade 3 and 4 hematologic toxicities (12% & 8%, respectively) [21,24]. High risk metastatic GTN is treated with multi agent chemotherapy (Table 2) . Etoposide, actinomycin-D, methotrexate, vincristine, and cyclophosphamide (EMA/CO) or with cisplatin (EMA/CE) is usually first line therapy. With EMA/CO the complete response rate is up to 71%, and overall survival can be as high as 91% in women with poor prognosis metastatic disease . EMA/CE is associated with greater hematologic and ototoxicity and peripheral neuropathy [26,27]. The complete response rate varies between 67 to 73% when it is used as second line therapy [27,28] Another regimen that has been used as salvage therapy following resistance to primary therapy with etoposide, methotrexate, and actinomycin-D (MEA) is 5-FU with actinomycin-D (FA). All patients must be encouraged to use effective contraception during the entire interval of monitoring, oral contraceptives are safe [17,21] importantly, and the frequency of later major and minor congenital malformations is not increased. The risk of abnormal pregnancy (spontaneous abortion, still birth, repeat mole) is greater during the first six months following treatment (for low risk or high risk GTN) than after a year following treatment;  therefore, patients are normally advised to avoid pregnancy for the first year following treatment [30,31]. First trimester ultrasound and serum β-hCG testing is indicated for women who become pregnant for the first time after treatment for GTN. β-hCG testing at 6-8 weeks after delivery to assure it has normalized and placenta should be sent for histopathology. Gestational trophoblastic neoplasia (GTN) is a malignant placental disease. The FIGO/WHO staging system (2002) has been used to define prognostic factors more accurately. Early adequate treatment ensures an excellent prognosis. All the authors participated in the literature search, interpretation of the articles reviewed and analysis of the data and review of the manuscript. All the authors have read and approved the final version of the manuscript. Miller FM, Laing FC Gestational trophoblastic disease. Society of Obstetricians and Gynaecologists of Canada. SOGC clinical practice guidelines: gestational trophoblastic disease. 2002. J Obstet Gynaecol Canada. 114. ©2016Slimani O. This is an open-access article distributed under the terms of the Creative Commons Attribution License, which permits unrestricted use, distribution, and reproduction in any medium, provided the original author and source are credited.